"I work at a coffee shop and my favorite coffee drink is a caramel macchiato so I created a caramel macchiato cheese cake that has become my favorite cheese cake." I have this posted on Allrecipes, check out the great reviews. 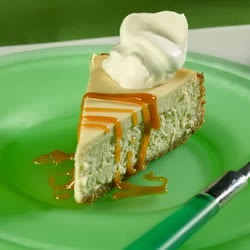 Also you can watch a video of myself making the cheesecake here http://allrecipes.tv/whatscooking/janesville_wi.aspx . up sides of a 9 inch springform pan coated with cooking spray. Bake at 350 for 8 minutes. Cool on wire rack. Reduce oven temperature to 325. Beat cream cheese at medium speed with an electric mixer until fluffy; gradually add 1 cup sugar, beating until blended. Add eggs, one at a time, beating well after each addition. Stir in sour cream, espresso and vanilla. Pour batter into crust. Bake at 325 for 1 hour and 5 minutes; turn oven off. Partially open oven door; let stand in oven 15 minutes. Remove from oven and immediately run a knife around edge of pan, releasing sides. Cool completely in pan on a wire rack; cover and chill 8 hours. Remove sides of springform pan. Cut into 10 to 12 servings. Garnish each slice with whipped cream and caramel sauce drizzled over top.